I think similar headlamp design is being used on the upcoming Kia GT Sedan. XG: 1998-2005 (This was when they tried switching to alphanumerics). So hopefully when everyone complains about the rear being a knockoff of the Charger or brand new Lincoln Continental, you all will know better. 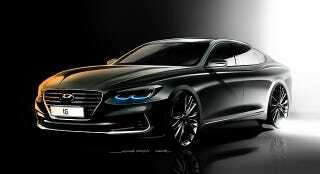 The Azera design is derived from the heritage of past generation models, which were mostly Mitsubishis. So the rear end is a knockoff of late 80s/early 90s Debonair derrieres. Sit on that!